With its vineyards stretching from just north of Florence to slightly south of Siena, Italy’s Chianti region has been producing wine since the 13th Century. However, the wine from the area wasn’t officially known as Chianti until the early 18th Century and starting in mid 19th Century was required to be made from a blend of grapes – the most common of which were Sangiovese, Canaiolo, Trebbiano and Malvasia. Unfortunately, many brands, particularly those that reached US shores in the 1950s and ‘60s were often flavorless, sometimes rancid products that came in squat, straw-encased bottles (fraschi) that once emptied were frequently used as candleholders on red-and-white-checkered-cloth-topped tables in more than a few mediocre-at-best Italian restaurants. Importantly, most Chiantis are now bargains in comparison to many of the overhyped, so-called super Tuscans from the same region. However, all the regulations and changes aside – including proclamation of quality beyond the DOC and DOCG guarantees by of various consortiums (signified by bottleneck labels with roosters, lions, etc) – some producers excel, and not only those in the best known Classico area –surrounding the town of San Giovani Valdarno. In fact, at a number of recent tastings there were many notable bottles from areas outside the Classico, especially Ruffina, Colli Senesi and Colli Fiorentini. Also, while the “riserva” designation denotes longer barrel aging (at least 38 months as compared to 4-7 months for “non-riserva”), it’s not necessarily an indication of quality, since as related to me by a Tuscan winemaker, "Non-riservas unable to be sold because of mediocre quality can always be aged longer with the hope that they can be sold for a higher price." In addition, like many Italian wines the labels are little help in determining quality, since rather than any varietal or nearby town the product can be labeled with names ranging from that of the producer, the vineyard, or even the winemaker's mother-in-law. 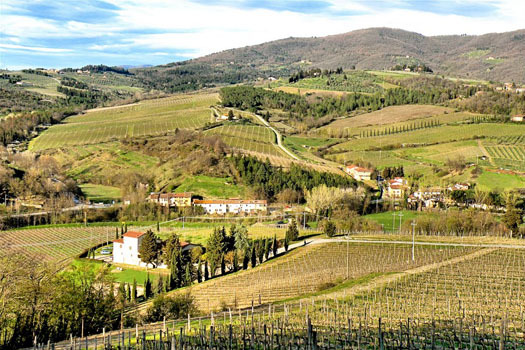 Based on visits to the Chianti region and a series of tastings over the past 6 months, the following are my choices (by style) for modestly-priced Chianti (under $30 US for a 750ml bottle), with recommendations for matching fare. 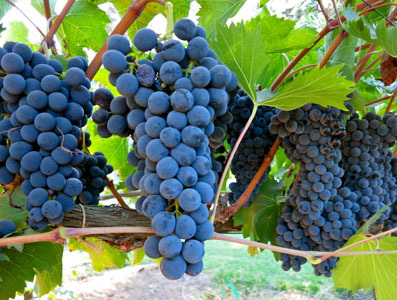 In general, these brands are rather simple and straightforward with fragrant bouquets of ripe fruit and an easy-drinking Beaujolais-like pleasant taste with cherry undertones and a smooth finish. Rarely benefiting from bottle aging, these wines usually make excellent mates for a range of hors d’ouevres ranging from mild cheeses to boiled shrimp and, smoked salmon, as well as “everyday” main course items like hamburgers and grilled chicken Caesar salad. Of note, the Strada is a bargain quaff, with a bit of aeration/decanting markedly enhancing its fruity flavor and taste, perfect to pair with pizza or Caprese salad. In general, decanting enhances the bouquet and flavor of these products and at their best they taste of violets, herbs and ripe plums with a dry, yet fruity finish. Of note, the Poppiano is made from a special selection of grapes grown in the foothills around Florence and aged for more than three years in small oak casks and shows a bouquet of black currants, herbs, and a rich complex taste. Match these wines with baked chicken, grilled game birds, veal parmigiana, and pasta with pesto or red sauce. In general, these brands show bouquets of cassis and violets, robust, complex multilayered flavors of exotic herbs and fruit, and long smooth finishes. The Castello Banfi and Monsanto products are particularly memorable, with intense flavors that last long after the wine is swallowed. Also, of note, the Banfi required little time in the glass to show its full bouquet and flavor, with most of the others in this category needing some decanting to reach full potential. Marry these wines with beef, lamb, calves liver and spicy pasta dishes. For more Chianti recommendations, click here. Disclaimer: This website is intended for visitors 21 years of age and older. If you are not of legal drinking age, please exit this section by clicking here.